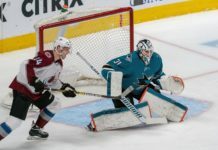 Erik Johnson was recently placed on the injured reserve list, retroactive to January 4, after being unable to finish the 4-1 Avalanche win against the Kings earlier this month. The injury is listed as a lower body injury, and fortunately for the Avs, it’s not the same knee injury that kept him out for part of the 2014-15 season. Without a doubt, Johnson’s injury hurts the Avalanche defensively, but the young group behind him has handled themselves well in his absence. The eight-game stretch without Johnson has called for a few guys to step up and play a bigger role with the defense, and all six have successfully done so. 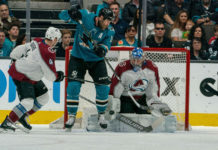 Since Johnson’s injury, head coach Patrick Roy has relied heavily on the Nick Holden–Tyson Barrie combination to fill a portion of the first-pairing role. And although their time on ice has more or less remained the same, Holden and Barrie are facing more important matchups and scenarios during their 21 to 24 minutes a game. “We are playing good, getting the chance to play against some of the top lines and stuff like that, so it’s been a good challenge and something we are enjoying,” Barrie said about the bigger role. Considering that Barrie has a heavy offensive aspect to his game, the heightened defensive responsibility might make a few Avs fans nervous, especially given that the man on the left side of Barrie is Holden, who began the year as a third-pairing D-man. However, both of which have tightened their defensive game throughout the season, earning the trust of coach Roy, as well as earning themselves those first-pairing minutes. In what has kind of become and even bigger role than before, 35-year-old Francois Beauchemin has been paired up with recent San Antonio Rampage call-up Nikita Zadorov. 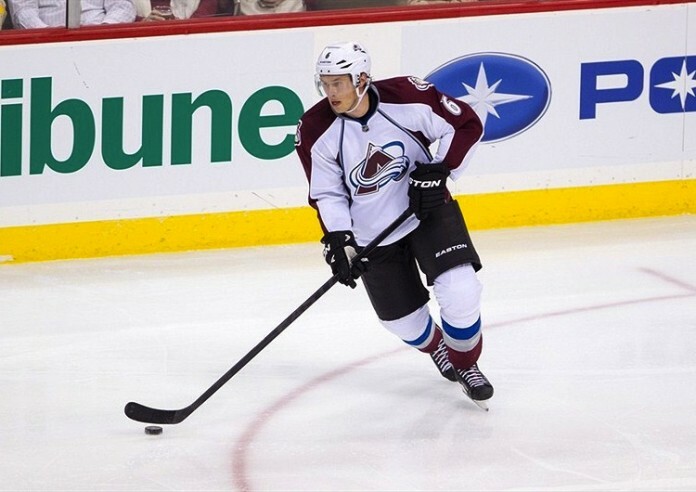 Zadorov, only 20 years old, is still in a phase of learning and maturing, so coach Roy placed him with the veteran Beauchemin to help him along. Considering Beachemin is one of the NHL’s leaders in blocking shots, taking him off of the first pairing, not letting him constantly face top lines seems questionable, but the help he’s giving Zadorov in his maturation process is invaluable. Also stepping up for the defensive group has been the second of two call-ups from the Rampage, Chris Bigras. In 37 games for the Rampage, Bigras scored six goals and 13 assists and has a fundamentally safe defensive game. In just three games for the Avs, he has one assist, but his sound decision making and improved strength have made the 20-year-old a promising fit for the everyday Avalanche lineup in the future. For now, though, he is still looking to gain some NHL experience in a limited role on the third pairing before his inevitable return to San Antonio. Following the 4-0 loss to the lightning on January 12, there is a reason coach Roy said they are missing Erik Johnson in the defensive end. Since Johnson has been out of the lineup, the Avalanche have been slightly above mediocre, posting a 4-3 record in that time. The guys have done an adequate job of stepping in for him, but Johnson’s presence will be crucial to a successful ending to the season. While those stepping up in his place are playing well, there is no replacing Johnson’s size or the experience he brings as a nine-year veteran. There is no definite timetable on Johnson’s return but he has been participating in all of the team activities and should be back soon. 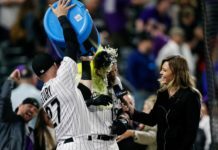 The Avalanche, currently at 49 points, hold the eighth spot in the Western Conference playoffs. Following Wednesday’s meeting with the Buffalo Sabres at Pepsi Center, the Avs have two important Central Division matchups in a back-to-back set. First, they’ll meet St. Louis this Friday at the Pepsi Center. Then, they’ll travel to Dallas to face the NHL’s highest scoring team and a real offensive threat in the Stars.